The 2 in 1 walking aid is handy when travelling either in a car or using public transport. 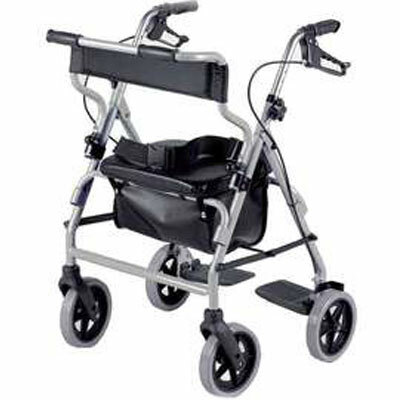 The walking aid is fitted with a padded seat and backrest. Theres storage for carrying items and is easy to use when walking indoors and outdoors. Max User weight of 110kg. The 2 in 1 Rollator and Transit chair is a high quality combination chair with great features such as a padded seat and backrest, its height adjustable, has easy to oprate loop brake handles and can be turned into a transit chair by flipping down the footrests. Theres an under seat basket for carrying smaller items. A lap belt for safety and a pushing bar with non slip hand grips. The large 100mm (8") wheels help provide easy manoeuvrability for both indoor and outdoor use. Can also be folded away for storage or transportation. We dont recommend that the 2 in 1 Rollator and Transit chair is used as a wheelchair for longer distances. It is designed to be used a transit chair for only short distances over a smoother ground. The foortrest are easily removed and can be stored in the bag when you decide to use the item as a rollator.